Cyren’s Cloud Sandbox Array service allows service providers and Cyren solution partners to easily deploy the next generation of sandboxing analysis, integrating a powerful security layer via Cyren's ThreatLookup API for enhanced web protection, email protection, endpoint protection or breach response. As a cloud-delivered service, it can be quickly deployed, requiring minimal set-up and configuration of the API calls, and scales easily and automatically utilizing Cyren’s highly elastic global cloud infrastructure. The only prerequisites for using the service are connectivity to threatlookup.com via HTTPS and possession of a token API Key. Cyren has automated the complex process of file analysis usually done manually by malware researchers, producing better analysis and deeper zero- day threat intelligence. As Cyren's sandbox array is purpose-built for cloud computing across Cyren's global infrastructure, it allows us to scale easily, utilizing highly elastic computing power to identify malicious behavior with both greater depth and speed. In many cases, a file's risk profile can be determined even before the actual dynamic analysis on the sandbox starts. 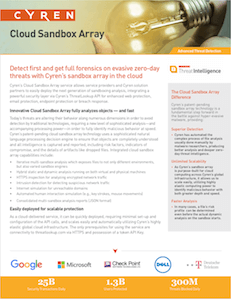 Cyren’s sandboxing array is an integral component of our GlobalView™ Threat Intelligence Cloud. This allows layered treatment of objects uploaded for analysis, giving service providers, ISV's and appliance manufacturers several options in selecting the depth of analysis which best meets their objectives, thus guaranteeing efficiency in the return of results. Solution partners can choose from five levels of service packages, ranging from instant evaluation via Threat Lookup to Sandbox Premium, which delivers a complete level of analysis and reporting for every file submitted. Each service package includes the features of the previous level. The file is detonated in the selected sandbox and monitored for mali- cious activity, as well as complete expression of all expected behavior. If the full set of expected behavior is not seen, then the file is recursively submitted to different types of sandboxes–which may vary by operating system, browser type, or virtual or physical environment–until full behavior is observed, and an aggregate threat score is calculated. Once malicious files and URLs are fingerprinted, the information is available across the Cyren global intelligence cloud within seconds.